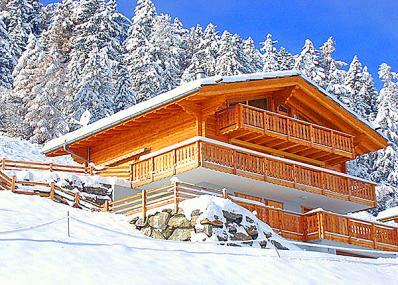 Very comfortable, charming ski chalet on three floors with open fire place and jacuzzi bath tub. Superb panoramic situation outside the resort, about 200 m from the skibus stop, in ~1,7 km distance from the center. Les Collons features shops, restaurants, pubs, ski rental shop, ski school, bank, post office. Indoor swimming pool and kindergarden (from 18 month on) in Thyon 2000, ~6 km. 25 km from the regional capital Sion. The chalet is situated on a wide eastward looking slope, with fantastic views down to the town of Sion (altitude 400m) on the left and the Matterhorn (altitude 4478m) on the right. Groundfloor: double bed room with ensuite bathroom. Utlity room for Ski clothes and electric heaters for the boots. Floor 1: Open plan kitchen, large living and dining area. Floor 2: master bedroom with an ensuite bathroom with jacuzzi bathtub. Another double bedroom which shares the bathroom with the fourth, small bedroom with bunk bed (full lenght, but suitable best for children). Depending on snow and weather conditions you can ski directly from the ski area to the chalet (no marked or prepared ski run, use at own risk). Chalet altitude 1.650 m; top of the ski slopes 3.330 m at Mt Fort glacier. ; 410 km of alpine slopes, 95 ski lifts, biggest Swiss ski area. New high speed chair lift Les Masses - Les Collons with parking deck at the base station. Huge snowparc 'Centralpark' at Thyon. Attractive sledge run between Thyon and Les Collons. Free open air ice rink in Les Collons. 12 km Nordic slopes.